The U.S. government didn’t rescue the banks. The Federal Reserve (FED) did. U.S. taxpayers did not pay for this rescue as is commonly believed. The Federal Reserve is overseen by the U.S. government, but it is a conglomeration of private banks that print America’s money. 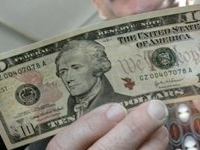 The U.S. government pays interest on the money it asks the FED to print. It’s unconstitutional because the U.S. Constitution says that only Congress can print money, but Congress never exercised that right and outsourced it to a national bank and then to the Federal Reserve in 1913. The U.S. government owes trillions of dollars to FED for printing its own money! Incredible! President John F. Kennedy wanted to bypass the FED and print money directly. Look what happened to him. The bankers of the FED rule the world politics and U.S. presidents including Obama. The U.S. owes more money to the FED than to China! The Federal Reserve is owned by private families. They literally rule world politics. John F. Kennedy signed an Executive order 00001 in May of 1963 to bypass the Federal Reserve so that the United States can print its own money directly and wouldn’t have to pay any interest. Look what happened to Kennedy. He got shot just six months after! The Federal Reserve is an enemy of the United States. They love it when the U.S. goes to wars because then the U.S. government borrows more money from the FED and owes more interest! The U.S. government doesn’t print its own money!! Incredible! How many people know this? Very few. How many Americans know that the Federal Reserve is privately owned and Americans owe interest to the FED for printing their own money? That interest is now more than seven trillion dollars! More than half of America’s debt is owned by the Federal Reserve! We need a revolution in America!! The private bankers who own the Federal Reserve are evil and wicked! Their judgment day before God Almighty is more certain and sure than all their ill-gotten money! Abraham Lincoln also tried to get the U.S. government to print its own money directly instead of going through a privately owned national bank and look what happened to him! Lincoln got assassinated. The Federal Reserve is a conglomeration of private banks owned by families in various nations, mostly United States and the United Kingdom. The shares or stocks to the Federal Reserve are closed to the public. Only these families can own them! The Federal Reserve isn’t part of the federal government anymore than Federal Express is part of the federal government. The Federal Reserve is overseen by the U.S. government, but it is privately owned and controlled by certain bankers and families. The American government doesn’t need to tax the wealthy or the middle class. Just get rid of the Federal Reserve and say no more interest payments to them! Government can print its own money directly as needed. With no taxes, people will have money to spend and drive the economy. Government won’t need to depend upon taxes with the Federal Reserve gone!
? Shocking News Cast Inside Wikileaks (movie) ?